Increasingly, we’ve come to understand buildings not just as solid and static structures, but as living, breathing generators of experience. Buildings weave together urban landscapes and oftentimes reflect and reinforce the established urban culture. Each design decision inherently selects against a multitude of others. In this way, design simultaneously includes and marginalizes people. An architect with an awareness for the political implications of design considers how space will influence social identities and collective behaviors. Professionals in the field have long conceived architecture as social infrastructure. Consider the intricate and thoughtful construction of the Colosseum, for instance. Each design decision — the calculated gradient of the amphitheater seating, the orientation of entrances and exits, and the width of the corridors — was carefully considered to augment the visitor experience. 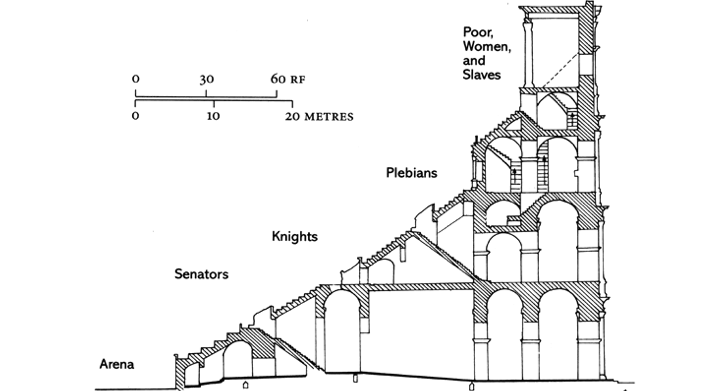 The Colosseum also communicated social ideologies. Tiers of seating were organized according to class and gender. As it did in Ancient Rome, architecture continues to communicate embedded societal norms and ideologies. The streets, monuments, homes, shops and community centers we navigate between have the capacity to fortify existing uneven social relations or disrupt them. Throughout history, people have targeted architects as masons of inequality. Many Marxist scholars, for instance, condemn the architectural craft for facilitating capitalist consumption. During Margaret Thatcher’s Prime Ministry in England, groups such as the New Architecture Movement and the Women’s Design Service bound together in resistance to the Royal Institute of British Architects (RIBA) for failing to include women’s needs and preferences in their building plans. The new groups lobbied and helped develop plans for more inclusive designs. So, what exactly does inclusive design look like? In Thatcher’s time, it likely meant incorporating women’s bathrooms in previously male-dominated spaces. Today, however, creating spaces of inclusion is slightly more nuanced, like adjusting air conditioning systems, redesigning lounge areas and rethinking office layouts. According to a 2015 study from the University of Toronto, women prefer egalitarian and collective work group structures and perform best when their environments reflect these preferences. Although this finding is not conclusive for all women and should not be universally applied to office design, an awareness for variable work styles and preferences may facilitate broader inclusion and optimize productivity in the workplace. With an awareness for the cultures that inhabit a space, architects can cater design solutions to their clients. The best way, in my mind, to strengthen awareness is to involve future inhabitants in the design process. By democratizing design, the behavioral preferences of users will be incorporated. These efforts are founded on the idea that space has the capacity to facilitate and impede behavior. With an awareness for the desires of future inhabitants and the agency of space, architects can engineer experiences of excitement, enrichment, inclusion, relaxation, and so on. Emma DeCamp is a Strategist at MKThink. She helps strategy teams better understand the cultural and environmental variables at play in their projects. She received her BA in Environmental Studies from Middlebury College. Lorne, Colin (2016) Spatial agency and practising architecture beyond buildings. Social & Cultural Geography 18:2, pages 268–287.